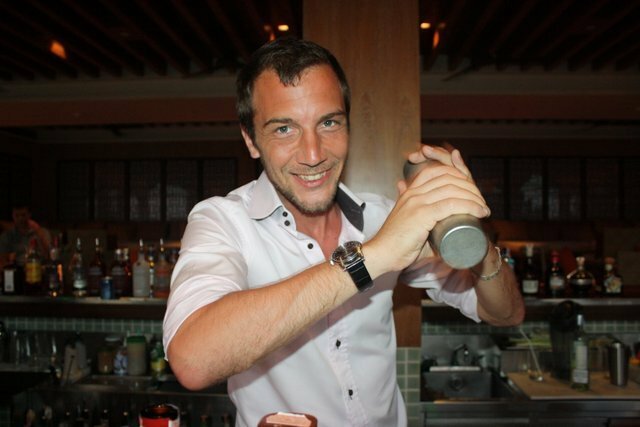 PHUKET: French mixologist Julien Defrance was in Phuket last week to run several cocktail workshops at the Centara Grand Beach Resort Phuket, at which he gave more than a fair dash of praise for Thai bartenders. French mixologist Julien Defrance demonstrates how to make the perfect cocktail. Mr Defrance runs his own cocktail consultancy company, Likidostyle, in Paris but comes to Asia every two months to promote the French liquor Grand Marnier. He has been working in the cocktail industry for the last eight years, after graduating with degrees in philosophy and Italian language. Asian bartenders have the finest ingredients in the world to include in their cocktails, he says, including an abundance of fresh fruit and unique herbs. “Thailand and Taiwan have some of the best bartenders in the world, they have a lot of skills. A major criticism of the cocktail industry he had however was that he believed bartenders in Asia were often guilty of using lower quality and cheaper alcohol and ingredients. Mr Defrance says he doesn’t have a favourite cocktail to make, but does like using coffee flavoured ingredients. He says the mojito is his most requested cocktail, but he has created a new design of his own to jazz it up. Mr Defrance uses fresh grapefruit instead of lime, coriander instead of mint, and lemon vodka and ginger ale. His signature cocktail is called a French Kiss, and is made from fresh raspberries, fresh lemongrass, vodka and honey. “But one of the most important parts of the cocktail is the smile of the bartender,” he says with a laugh.